Certain things grasp the internets hold and spread like wildfire over social media, for better or worse. These social media phenomenons, such as “The Dress,” can pose unique branding and marketing opportunities for automakers. When done right, they can create an extremely successful impact. Holden’s quick reactions to “The Dress” controversy were incredibly quick and well timed, beating many other companies and brands to pulling their own interpretations. They even beat keyboard warriors to the inevitable waterfall of memes flooding our Facebook timelines. 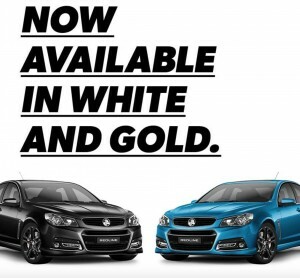 Simply, two VF Commodores sit underneath bold text reading, “Now available in white and gold.” Witty, tasteful, humorous and incredibly well done on Holden’s part. If you’ve been under a rock for the past few days, “The Dress” is paralyzing persons’ retinas in what two colors they see. One side says white and gold. The opposing say blue and black. For what it’s worth, yours truly sees both sets. Tip of the hat from us to Holden for the excellent response. Now, back to your regularly scheduled internet bickering over colors.